Okay. Well other than that its pretty solid i enjoy it. My younger brother actually likes it too and he totally hates fighting games so thats a +1. I havent really found anything besides the things that have been stated though. And I have tremendous respect for the fact that you also took the time to do an upload, unlike others who say they have a "Full Game", but there's no link. This is truly a thread to watch. Great job; keep up the excellent work! Just tried it out... here is my feedback . - Lifebar color is too dark please brighten it a lot please . - What's purpose for green bar above at lifebar ? Is that supposed to be super meter ? Wow it's really dark and not only that , it's not separated well enough to tell what level super you are currently in . - Fullscreen causes weird coloring , bad FPS , and overall bad performance . - Music isn't looped . I have ADX file that loops for Pit 3 ( Tekken 5 DR Hall of Fate Resurrection ) BGM if you want . - Player 2 is sometimes unable to throw ( Tested on practice mode with P2 being SLII Akuma ) , maybe something to do with control settings at start-up ? - Red borders sometimes display of the MUGEN window . Maybe identical with the issue in #3 of this feedback . - Where's the combo indicator ? - I believe the hitstun from most attacks need adjustments . 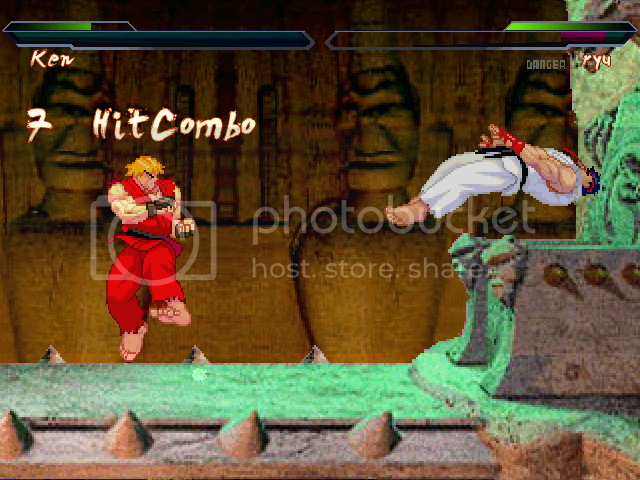 Example : SLII Akuma's Jumping Short air normal does MORE hit stun than his Jumping Roundhouse air normal ( ...) . The weakest one should need less hitstun while the more fierce ones need more hitstun . - Dashing normals with Shin Level II Akuma is neat and something I would like the game to have as part of the mechanics , but I noticed that Shin Level II Akuma can't do certain crouching normals ( normals = normal attacks ) after dashing , and so far only his Crouching Short ( Short = Light Kick ) and his Crouching Roundhouse ( Roundhouse = Hard Kick ) can be canceled from a dash . Will you try and get the other crouching normals to work as well please ? - Shin Level II Akuma's Cr.Strong ( Crouching Medium Punch ) and Cr.Jab ( Crouching Light Punch ) definitely needs adjustments . The Cr.Jab hitbox needs to be smaller imo since it's the same as Cr.Strong ( With the exception of Cr.Strong having hardly a hurtbox compared to Cr.Jab , which is probably fine ) . The start-up of Cr.Jab is perfectly fine though since 3 frame Cr.Jabs are common in fighting games . Usually for shotos like Akuma and Ryu they always have 4 frame start-up Cr.Short and 3 frame start-up Cr.Jab . By start-up I mean starting animation before attack frames come out . - Shin Level II Akuma needs a damage overhaul . His Cr.Fierce ( Crouching Heavy Punch ) doing less damage than Cr.Jab and Cr.Strong for example just isn't right . Cr.Short needs SLIGHTLY less damage than Cr.Jab . I believe Cr.Forward should do SLIGHTLY less damage than Cr.Strong . Cr.Roundhouse needs to do SLIGHTLY less damage than Cr.Fierce . - I believe ALL of his hadouken variations including supers at point blank range (Close) will whiff as if the hadouken never hits the opponent. - His dive kick REALLY needs adjustments . The hitbox on the dive kick is going to blow people up and there is nothing that can stuff or trade with it because the priority is INSANE lol . Definitely he would be OP in this game if he keeps this hitbox . Even if it's parried , the player who parried would just get +1 advantage which is nothing and on top of that has to deal with cross-ups SOMETIMES . I think overall his divekick's hitbox and hitstun needs to be decreased . - This probably goes for everyone as well , but the first few frames of jumping has a big hurtbox , and should be decreased imo . Players won't be able to jump on reaction too well in the corner against fireballs . - His Close Standing Jab takes a LONG time for the attack frames to come out , having a really long start-up animation (11 start-up frames LOL) . - His QCF Kick (Vertical Tatsumaki Senpuu Kyaku I assume) into dive kick setup can be cheap mainly on block . If the opponent blocks he's going to continuously eat the same pattern over , and while it could be punished , it's strict timing and maybe some characters don't have the anti-air tools to punish it . Only punishment I know for this setup using SL II Akuma for example is his st.jab or maybe cr.fierce preemptively . - His jumping normals need adjusted active frames from his attacking air normals . Ex : His Neutral Jump Fierce is only active for 1 frame... Should have more active frames . - His air throw needs reduced active frames and maybe slightly reduced hitbox (but not by much). It is currently 5 active frames . I suggest it should be 2 active frames . The same could go for Chameleon . - His Crouching Short and Crouching Forward needs to hit low . - If he has one of those slow fireball supers out there and the falling cinematic occurs , they will stay in middle of screen going forward and onto the lower section of stage . - Backdash I believe needs some early invincibility frames (Airborne possibly as well) . No it won't be cheap either because an opponent can always OS (Option Select = Doing an input after another input , letting the game decide what inputs to do based on your opponents actions . https://www.youtube.com/watch?v=KSl8-topFag shows a perfect example what a backdash OS is , in which the backdash has invincibility so attacking the BLOCKING opponent freezes yourself in air , preventing the move to come out , while a backdash lets your whatever normal whiff and you will land in time for the OS to come out .) in a more advanced level of this game , which I'm sure will happen . - Jump in attacks needs the player to freeze more in the air a good bit on hit or block ( NOT ON WHIFF AKA MISS ). This is needed for certain OS'es like above to exist in the game . -In some cases after normals or after a jump , you are unable to do a instant crouching normal . Like if you land and your holding down and you go for low jab (crouching light punch) you will get standing jab instead . Would be nice if none of these errors would come out . - Sweeps need untechable knockdown . You are able to quick rise after sweeps and imo they serve as a role for mix-ups . I think the overall animation of when they fall to the ground from sweep needs to be more simplified and quicker instead of staying on the ground for a long period of time to make a mix-up setup . - Any chance of counter hits coming to fruition ? - Will you be able to tech throws in future versions ? - Any chance you can cross-up opponents while they are in the corner in the future ? - Will Kara-Throws exist in the future as well as Kara-Canceling special moves ? - Will there be a pack for this game which doesn't contain cinematic like stage transitions ? + I'm glad to see the unavoidable throw setup on blocking opponent is gone . + Nice to see that you can OS supers or special moves after certain normals . Example : With SLII Akuma you can do Low Forward ( Crouching Medium Kick ) into one of his supers by option select at mid-range when they walk forward by accident . + Like the addition of that silk silver palette for SLII Akuma , it looks nice ! + Looks good overall and I can't wait to see this game in improved form . Mortal Kombat, is not about death, but cheating in mame. Need Mame cheats? Go Here. Well, I'm thinking of uploading a beta (0.2) with these 2 characters but no bugs .. or prefer a beta (0.3) with a character more? I say we go step by step, 0.2 and later on 0.3. AceKombat just gave us a hell of a feedback and we've got quite some work to do. Oh and btw about the health situation , I would suggest that in the later versions that SLII Akuma and Chameleon should be the two characters , if not the only two characters with the lowest health in game . I say this because they have a lot of tools in their arsenal , Chameleon should usually rely on ice clone zoning and on top of that he has other moves that can shift playstyles , so for something like that he needs low health . As for S.L. II Akuma , while he may not have the great amount of zoning Chameleon can do , he has really good footsies and pokes to throw out , and he has a seriously great offensive game . Basically from what I see , Chameleon looks like he is meant purely for zoners although he has things to throw out to play mind games with the opponent , while S.L. II Akuma seems to be more of the kind of person that relies on rushdown with a mix of footsies , partial vortex setups ( EX : I'm sure he has dive kick setups on opponent knockdown that can lead to heavy mix-ups ) and possibly above average zoning . Not a bad idea. I just talked to firelord and we'll make copies of chameleon and akuma. The lower health versions will be selectable, while the normal health versions will be used by the computer and positioned in angles unreachable in the select screen. They will also, of course, be invisible in this screen. Well, first thanks acekombat for the time you taken to do that, we are fixing all that bugs, one of them all about "Renders" bugs, but i have to remember you this is not sfiv and this game have different gameplay, But I do like some ideas like that thing of the dash.. Your welcome and thank you and other authors on working on this . I'm aware this won't be SFIV , and I definitely would not like this to be just like SFIV , and if it was too much like SFIV I wouldn't be here giving feedback in the first place . I'm here because I like the overall potential this game has and it's own unique gameplay . -I believe it was mentioned above, but certain moves need more hitstun than others, it would make the game feel less like another M.U.G.E.N. IMO. -Instead of having the floor break after a certain amount of times, I think It should break depending on how many times a character is knocked down from the air into the ground. -Jumping(For me, maybe others get this as well) feels clunky, it may just be me though. -Several times, while falling down from the stage breaking apart, your character or your opponent's character may get stuck in the ground, mid air, or somewhere off screen. -The lifebar looks way too dark, I think it would look much better with a lighter shade, and even better if it resembled the lifebars from the original flash. -Parrying feels kinda weird for me, as I'm almost never able to do it, but I can pull it off whenever I play SF3:3S on my computer. That's all I have for now, pretty much. Not meaning to offend you guys in anyway, just sharing my constructive criticism. I will DL and test when my comp gets hooked up again. Thanks for reading my signature. SFIV font is a no no . It doesn't look good for this game . Needs to be more original to the MK VS SF environment . Closed, the new things will be in the general topic.